MGM Springfield opened in Downtown Springfield last weekend with a huge variety of dining, drinking and entertainment options. But make no mistake about it, MGM Springfield, Massachusetts’ second commercial casino, is a casino first and foremost. The Massachusetts casino boasts 125,000 square feet of gaming space with 2,550 slot machines and 120 table games. The table games offering is on par with most high-end Las Vegas, Nevada casinos. Dealers have either migrated over from other casinos in the New England area, or gone through an extensive training program at the Massachusetts Casino Career Training Institute designed for MGM Springfield. New dealers that stay with MGM Springfield for a minimum of 12 months will have the program’s tuition costs reimbursed. MGM Springfield’s blackjack, craps and roulette offerings are relatively standard and will surely be familiar to most casino patrons in the US. However, most will likely be less familiar with Mini Baccarat and Midi Baccarat. Mini Baccarat is designed to be a lower limit and faster version of the Baccarat games usually only found in a casino’s high-stakes area. Instead of 14 spots, there are usually only seven. Plus, the dealer turns over both the player and banker hands. Players never touch the cards. Midi Baccarat more closely resembles high-stakes Baccarat. The tables usually feature as many as nine positions. The player with the largest player wager is allowed to turn over the player hand. Plus, the player with the largest banker wager turns over the banker hand. However, extremely slow squeezing like one might find at a high-stakes Baccarat table is generally frowned upon. Pai Gow, Three Card Poker, Four Card Poker and Ultimate Texas Hold ‘Em are popular poker table game variations. Criss Cross is a less-popular poker table game variation that involves betting hands using five community cards laid out face down in a cross pattern. Players bet on the strength of various hands put together according to patterns on the cross. Chase the Flush is another less-popular poker table game variation that involves competing against a dealer using three hole cards and four community cards to make the longest possible seven-card flush. Players win by having more cards of a single suit than the dealer. War is a casino table game based on the children’s card game of the same name. Big 6 is a casino wheel or Wheel of Fortune-style game. MGM Springfield reportedly offered several table games with limits as low as $15 during its opening weekend. 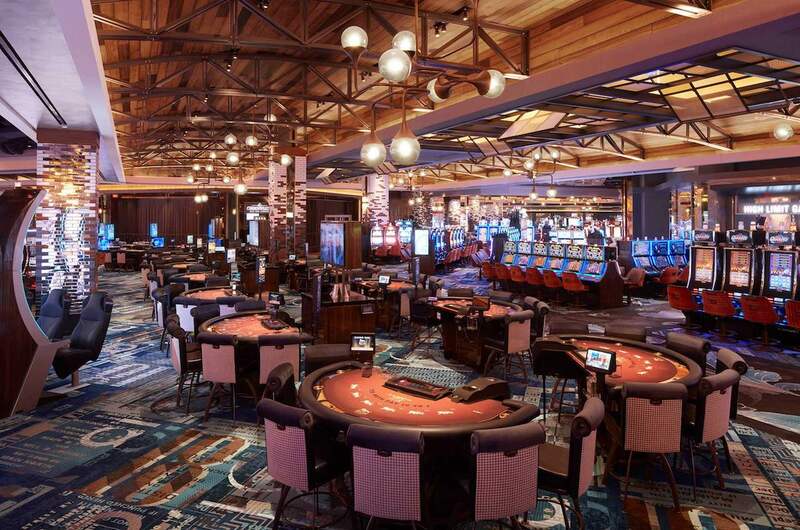 MGM Springfield’s table game offering includes a 23-table poker room, so all speculation can be put to rest. The MGM Springfield website claims the poker room hosts the ultimate poker experience in a setting unlike anything players have experienced before. There is also complimentary drink service and alcohol is served until 4 a.m. The room spreads no-limit hold’em, Omaha and seven-card stud games. The buy-in for $1/$2 no-limit hold’em games is from $100 to $500. It’s $300 to $1,000 for $2/$5 games. Competing area poker rooms including Foxwoods Resort Casino (over 100 tables) and Mohegan Sun (42 tables) are larger. However, both of these Connecticut-based poker rooms (that are just 75 miles away) cap $1/$2 buy-ins at $300 and $2/$5 at $500. MGM Springfield is a completely smoke-free property. However, there are two designated smoking areas outside, including one on State Street just outside the poker room.